During the Bronze Age, the inhabitants of Anatolia managed to combine bronze with tin and using this alloy produced items such as cooking pots and ornamental objects. All the civilizations which inhabited Anatolia added their own styles and values whenworking with metals and these are still reflected in the goods today. 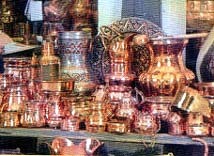 A wide variety of attractive hand beaten copper goods can be found such as plates, bowls, kettles and coffee sets.